“Darling, do you still remember the memorable moment that marked our fateful meeting?” asked the young and cheerful lady, sitting by her husband’s side on the verandah of their humble abode. “Of course, my dear,” was the gentle and caring reply that sounded from the burly and fine-looking archer’s mouth. “My dear Chang Er (嫦娥), how can I ever forget that most wonderful moment in my life?” he continued, as his normally vigilant eyes instantly became calm upon hearing the sweet voice of his wife. Indeed, her voice was the sweetest melody any being can produce, for there was no sweeter sound which could compare to that of his ever-so-precious companion sitting by his side. 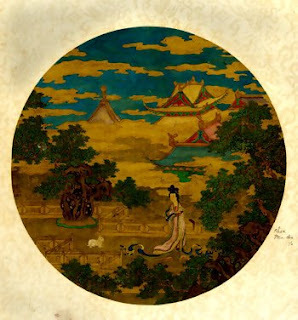 As Houyi (后羿) gazed into the wilderness beyond the confines of his humble abode, flashes of memory came flooding into his mind – memories beyond words and imagination – and immense happiness radiated from his broad smile as long as those memories remained dancing around before his mind’s eye. There he was – a wandering archer who had lost his way unexpectedly in the depths of the forests somewhere in the Middle Kingdom while he was endeavouring to hunt and catch some beast which could keep six stomachs at home full for the rest of the day. As he continued wandering, sweat started flooding the surface of his eyes. He felt as if he was going to collapse any moment at that time. “No, I can’t collapse here!” he thought. “If I do, I’m gonna end up as grub for the wild beasts!” Just as he was about to give up all hope in utter despair, he saw a stream flowing nearby. It was not exactly the stream that attracted his attention, though, but rather it was a beautiful young lady collecting some water from the stream. Exhausted as he was, he could swear that his eyes did not play any illusion on him. But what was a young pretty lady doing in the middle of nowhere? 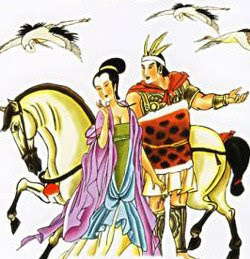 As he approached her silently and curiously, she slowly turned her face towards Houyi. Wow! Out of utter astonishment, he gaped and was momentarily stunned. The unique countenance that was now before his very eyes was beyond the description of infinite words. It was as if a beautiful lotus had abruptly blossomed and opened to reveal within itself an illustrious gem with radiance beyond amazement. It was as if yin had unexpectedly banged into yang in the strangest, yet most tranquil of places. Oh, how magnificent that countenance is, even more magnificent than the blossoming of spring after a hard and harsh winter, he thought. “Had I not brought you to my village nearby, who knows what your fate could have been…” said the very same young lady, who was now beside him, breaking his reflection of the memorable event that occurred just two years ago in the middle of nowhere. Indeed, Houyi felt that it was, after all, worth all the sufferings of that fateful day that he had to endure, for without them, he would not even have the slightest chance of meeting the woman who was now his precious lady. Courageous but eternally captivated by her radiant countenance as he was, he was unwilling to exchange those sufferings for anything else the entire world could offer. “Houyi, Houyi, HOUYI!! !” Someone came running abruptly into the archer’s abode. It was his farmer neighbour, who spent most of his time working in the village’s fields. “HOUYI!! !” He came running hastily into the entrance to the verandah, but halted instantaneously upon seeing the marvel that the young couple was putting up before his very own eyes. “Oops, sorry for the disturbance,” he said, blood flushing through his face and ears. “Oh, no, no, no, that was nothing!” Houyi replied hastily, withdrawing himself away from his partner. The couple’s faces turned as red as juicy tomatoes. Silence ensued momentarily, as the three overcame their excitement of the enchanted moment. “You were saying…?” Houyi started, breaking the silence. “Oh yeah!” the neighbour exclaimed, remembering his purpose of being there. Without giving a second thought, he hastily grabbed hold of Houyi’s right hand and dragged him out of the house forcefully. To Houyi’s surprise, it was blazing hot outside his humble abode. The land was terribly scorched by the raging heat from above. The vegetation on the village farms which the villagers depended on for survival was awfully dehydrated. In fact, his fellow villagers, who worked endlessly on the farms to ensure the village’s sustenance, were now wriggling like dehydrated worms on the ground as they gasped desperately for water. It seemed as if the inhabitants of the entire land were all at the verge of perishing if nothing was done immediately to eradicate the problem. What exactly had happened to bring about such a calamity upon those villagers? Houyi’s neighbour then pointed to something above them. Houyi tried to look above, but it was almost impossible. The skies were shining so brilliantly that vision was rendered almost impossible. Houyi tried closing his eyes a little with both his eyelids and his hands until he could roughly make out what was above their heads. Vaguely, but only very vaguely, he could perceive the outline of ten blazing balls floating above their heads amidst the clouds. Ten blazing balls?! Ten suns? Houyi quickly turned towards his neighbour, who was anxiously awaiting a response from the skilled and renowned archer of his village. “Do you mean to tell me that there are TEN SUNS above our heads today?” Houyi asked his neighbour, impatience and anxiety ringing in his tone. His neighbour silently nodded his head in agreement. Abruptly, Houyi sprang like a tiger pouncing on its prey and rushed into his house without further thought. A short moment later, he came out, holding an extraordinarily large bow and ten well-refined sharp arrows along with a black cloth. “Of course I do! Is there a problem with that? !” was Houyi’s reply. The courageous archer immediately blindfolded himself with the black cloth and positioned himself with his bow and arrow. It was no easy job, and he had to pour out all his might, will and courage into each arrow in order to get the job done. He grabbed the first arrow and set it on his bow, took perfect aim at the rough outline of a sun that he could perceive through the blindfold, pulled the arrow as far behind as he could to transfer as much power as possible onto the arrow, took a deep breath, and released the arrow with all his might, accompanied by an earsplitting scream that resonated throughout the entire land. Amazingly, the first sun that was targeted fell after being shot, and then it was seen no more. So Houyi did the same with all the other suns, taking aim and shooting them down one by one with his astounding and remarkable strength. Each sun that was shot fell immediately beyond the distant mountains and was then seen no more. With each sun that fell, the earth gradually cooled and the skies became more and more visible. Seeing that the suns were dropping one by one, all the villagers from the houses and the fields scurried over to the great archer to see his marvelous act of heroism. Awe filled their faces when they saw the stance of the great archer taking a perfect aim each time and releasing each arrow with all his might. Each arrow rushed out swiftly from his grasp onto the vast skies above before piercing through the raging suns above and consequently ceasing their existence. 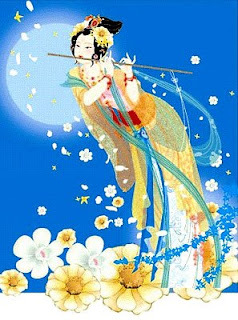 Nine suns had already ceased to exist and Houyi took hold of a final arrow before taking aim at the lone sun left amidst the heavens above. “No, Houyi, DON’T!” shouted some of the villagers. “Why not? Do you all want to burn to death?” asked Houyi in surprise. 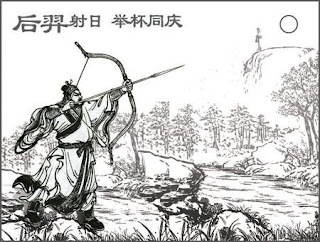 With that, Houyi lowered his bow and arrow without a word. A sense of accomplishment radiated from his face as he looked at the villagers who were now staring straight at him, speechless. A loud cheer then erupted from amidst them.